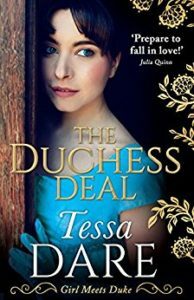 I was thrilled when Mills and Boon asked if I would like to be part of this blog tour for Tessa Dare’s brilliant book, The Duchess Deal, and on publication day! I’ve been lucky enough to be supported by some wonderful book bloggers on my own tours, so it’s been great to see it from the other side, as it were. I always knew it was a lot of work, but have even more respect for the all that goes in to them now. I was sent this book by Mills and Boon a little while ago, and as a historical romance is not something I’d usually choose, I didn’t read it straight away. One afternoon, I casually picked it up and from that moment, I really didn’t want to put it down! To give you a taste of why not, read on for the full review, and an extract of the book which is published today! You can buy it here Don’t forget to leave a review if you have a minute. We authors rather depend on them, so if you could it would be fabulously helpful and will help spread the word about this great book! This is the first Tessa Dare that I’ve read – but it certainly won’t be the last. Although I love the Regency period, I’m not sure this was something I would have picked up especially, but I was sent an advance review copy and I am so glad because I am now looking to read more of this author’s books. I absolutely loved this book. Although historical in setting, it has a very contemporary feel to it and I adored the sarcastic humour of the Duke and the sassiness of Emma. I’d definitely recommend it! A young woman in white strode into the room. His boot slipped from the desk. He reeled backward and collided with the wall, nearly falling off his chair. A folio of papers tumbled from a nearby shelf, drifting to the floor like snowflakes. Not by her beauty—though he supposed she might be beautiful. It wasn’t possible to judge. Her gown was an eye-stabbing monstrosity of pearls, lace, brilliants, and beads. Good Lord. He wasn’t accustomed to being in the same room with something even more repulsive than his own appearance. own pride. He was shielding himself from . . . from that. “I’m sorry to impose on you this way, Your Grace,” the young woman said, keeping her gaze fixed on some chevron of the Persian carpet. in gowns and in prospective husbands. She tilted her gaze to the ceiling and gave a despairing sigh. Now that the shock of her revolting attire had worn off, Ash turned his attention to the young woman who’d been devoured by it. She was a great improvement on the gown. Complexion: cream. Lips: rose petals. Lashes: sable.